Mix the flours salt and add water little by little to form a dough. The dough shouldn't be very soft now cover it for 1 hour with cling wrap. Make a thin roti of the dough and cut the puris with a cookie cutter or a small katori. Heat the oil in a kadai and fry the puris on a slow to medium flame until golden brown in the color. paani for puris,soak tamarind in hot water for 10 minutes now deseeds and grind it. 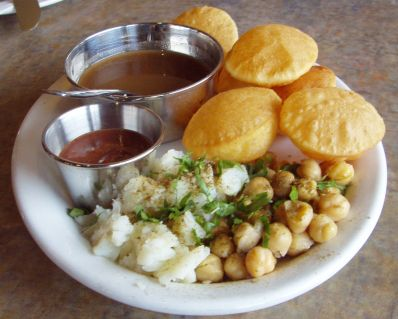 Boil water and add all ingredients of "paani for puris" lets boil it 2-3 minutes now add tamarind sauce and cook it 5 minutes. For dates sauce, soak dates and de-seeds it and grind it with water and boil it for 2-3 minutes sauce should be thick. Beat a yogurt very well and add chaat masala to taste. Make a hole on 1 side of each puri and fill it with few chikpeas and potatoes. Add dates sauce,yogurt,green chutney in the hole of puris and serve it with paani. sorry its a fennel seeds..
hello salma. will u plz tell me what is funnel powder?? My...my... what an appetising look of those paani puris and other stuff displayed in the picture! !